INVITED to perform, in 2015, at Jakarta’s Kota Tua Jazz Festival and then at the Bali World Music Festival, Indonesian pianist/keyboardist Dwiki Dharmawan, British saxophonist/clarinettist Gilad Atzmon and Kuwaiti oud player/guitarist Kamal Musallam chose to consolidate their new-found partnership as the World Peace Trio. Creating a tingling fusion of musical strands – as well as importantly demonstrating an absence of cultural or religious divide – the trio followed up each of these festival performances by capturing their essence in local studio recordings, honing down a larger amount of material which flowed from the sessions into this hour of hypnotically exotic grooves. Atzmon’s impressive Orient House Ensemble catalogue of Israeli-inflected jazz improvisation and cabaret eccentricity is well-loved – and here, that signature clarinet and sax vibrato melds sublimely with Musallam’s evocative oud textures and Dharmawan’s profuse, polychromatic piano to fashion music which displays oriental and gamelan luminosity. With the majority of these eight, spacious numbers being co-composed and improvised as a trio, the connectional freedom is tangible as themes are introduced and then expanded through heady, often repetitive environments – so The Seeker‘s mysterious, rhythmic motif crescendos towards Atzmon’s dry, reedy acclamations; and the aromatic kendang-and-oud impetus of traditional Palestinian song Ramallah, across almost eleven minutes, finds Atzmon’s low, fervid clarinet electronically ‘whistled’ in higher register. Another kind of beauty is reflected in quieter pools. Nasser Salameh’s high, hollow frame drumming accentuates Morning Mist‘s overlapping melodic chants; balmy Peace and Beyond shimmers to Dharmawan’s electric piano, along with Asaf Sirkis’s intuitive snare and open cymbals, before Musallam’s energized midi guitar soloing ramps up; and in a particularly original interpretation of Gershwin’s In a Sentimental Mood, coruscating piano and kendang patterns give way to a rapturous central section of oh-so-romantic clarinet and piano. The intense, addictive gyrations of Ghaza Mon Amour (from Atzmon’s album ‘The Whistle Blower‘) seem made for this trio, with guest Ade Rudiana’s driving kendang spirit coaxing angular yet rolling piano, fierce oud improv and electronically-manipulated soprano sax enunciations – a quite mesmerising cocktail. And segued by the dreamy piano and questioning reed escalations of Anecdote, expansive Dawn paints an awakening aurora of gathering positivity through fluctuating, episodic imagery. A stimulating project whose concordal ambitions are as much about world harmony as musical discovery, it’s tantalising to imagine how it might evolve by inviting guests from around the globe to add their cultural imprint. 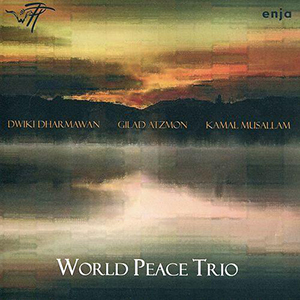 Released on 18 August 2017, World Peace Trio is available from Proper Music, Amazon, Apple Music, etc.